Custom framing is a striking way to finish and preserve your Randy Owens serigraph. Using mats hand painted by Randy, these unique creations are available to our collectors on all of our art work. First, mats are cut to the size of your art and hand painted in the studio. ​Next, Randy takes a jar of paint and a knife and slings paint onto the mats to create accents that create a sense of speed. Finally, a notched, white mat is placed on top of the hand painted mat to create a pure white background with the hand painted mat acting as a border for the entire piece. We use clear acrylic with UV inhibitors instead of glass to protect the piece from sun damage. The finished frame is anodized black aluminum which frames the bright white mat beautifully. We included picture hooks for easy hanging. Framing is made to order. Please allow 2-3 weeks for shipment. 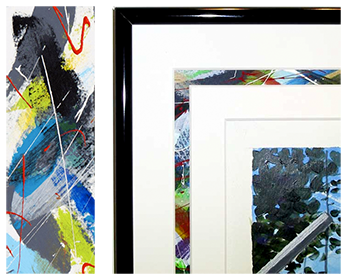 Framing prices vary based on size and can be found with your selected piece of art in the Online Store. During the Christmas season, we stock extra framing materials, so we can framing orders completed quickly. Call us at the studio (410) 956-0144 to see if we can get your framed order done and shipped in time to arrive before Christmas! Generally, if ordering more than 2 framed pieces, it is best to call the studio (410-956-0144) to place your order. Our web-site shipping system is based on dimension weight and size of box used for shipment. Because of the various sizes of framed pieces that could be ordered together, our shipping system is not designed to handle multiple frame orders. Custom Framing - Art is custom matted and framed with black metal frame. Poster Framing - Anodized black metal frame with clear acrylic and foam core backing. Frame is sized to fit poster.